I recently had the chance to visit Lassen Volcanic National Park this past June. Most of the park was covered in snow so I headed off the beaten path to the outskirts of the park hoping to find something a little less photographed. Here is a view from the top of a cinder cone of rolling painted hills, it was well worth the walk up to the top. 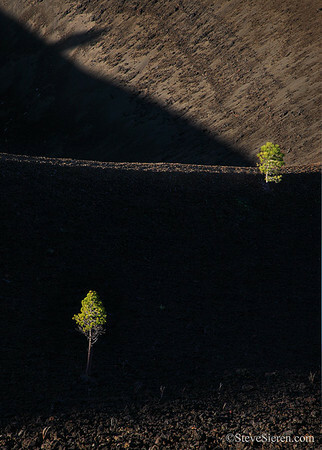 In the image above I was watching the shadow from the lip of the cone slowly move across the scene just before it revealed the trees completely. It wasn’t very slow since I remember having to react quickly while I was thinking why can’t the trees be exactly where I want them to be? The shutter fired away since some moments pass and the oppertunity is lost until a next attempt. Who checks under the hood everytime before they get in there car? I don’t but I had a slow leak at the time so I was pretty surprised to find this basketball sized living rodent just sitting cozy and comfortably as it was in the beginning of the video. After 2 trekking poles and a ranger with 2 brooms sticks we got the marmot to run for the woods. Out of pure curiosity, I have always wondered what a marmot tastes like so lucky for him or her there wasn’t a roasting. Visit Steve’s galleries or find workshop listings here. This entry was posted on December 26, 2010 at 11:45 pm and is filed under Uncategorized. You can follow any responses to this entry through the RSS 2.0 feed. You can leave a response, or trackback from your own site. Beautiful shots! I love the luminous clarity of the trees on the abstract lava background. I ate a couple marmots in Mongolia years ago; they’re something of a delicacy there, and certainly an inordinately popular hunting quarry. (They’re probably jaded to them by now, but in 1995 hats and other stuff with the Marmot company logo made great much-appreciated gifts.) They were like somewhat greasy, stringy pork carnitas, not bad really, and certainly a huge step up from the boiled mutton which constitutes most of the Mongol diet. Great photos. I love the light and shadows. As for critters in the engine. I used to live next to the national forest in Sedona, Arizona. If my car was parked for more than 24 hours, you had to pop the hood before going anywhere to check for pack rat nests. In a day they would bring piles of pine needles and pine cones onto the engine to make a nest. They also loved to chew on wiring, tubing and anything plastic. Our mechanic made some nice money replacing chewed wires. I’ve also had the occasional cat in the wheel well. 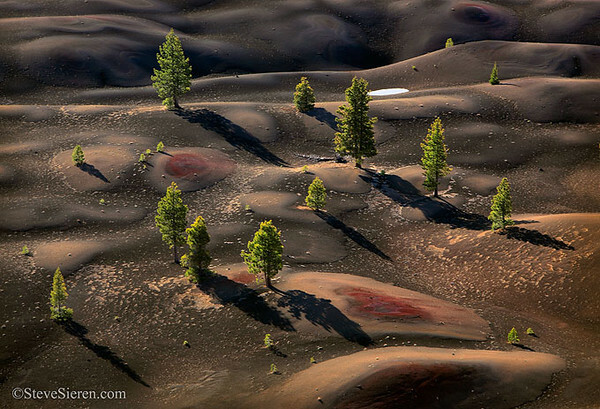 Great picture of the painted hills. My wife and I hiked up there in August for sunrise and it is a fantastic view. Personally, I had a hard time getting clean shots of the painted hills as it was incredibly windy once sunrise hit. I don’t think I have that problem before. Or at least I never knew I did. Steve, beautiful photos! When we visited Lake Almanor in July, we had a rat climb up in our air conditioner. We didn’t know it until we turned it on, of course. Who knows how long he was in there. When Jeff got it out, he was still alive, with only a missing tail. Go figure! I’d heard of engine marmots at Mineral King — so much so that I was afraid for my radiator hose when I finally went up there — but never at Lassen. Glad he didn’t chew anything up. So THAT’s where he is now! Last Summer I gave that guy a ride from Saddlebag Lake to Bridgeport in the Eastern Sierra. He looked pretty confused when he hopped out and ran into a grassy field. The previous Spring it was a bunny, who was much happier swapping the snow in Truckee for the green grass of Auburn when he jumped out.